1. The interest rate on the main refinancing operations [MRO] of the Eurosystem will be decreased by 25 basis points to 0.75%, starting from the operation to be settled on 11 July 2012. 2. The interest rate on the marginal lending facility will be decreased by 25 basis points to 1.50%, with effect from 11 July 2012. 3. The interest rate on the deposit facility will be decreased by 25 basis points to 0.00%, with effect from 11 July 2012. What does this mean for financial institutions and the ECB's attampt to ease credit conditions across the Eurozone? 1. About €180bn is currently borrowed under the MRO, and the rate cut should provide some relief for periphery banks who are the primary users of the facility. But the cut translates into savings of about €37.5 million euros a month - for all the banks using the facility combined. This is clearly helpful but is going to make little difference in these banks' behavior (in terms of credit) because they are looking for liquidity relief, not a tiny reduction in their borrowing costs. 2. Only €0.7bn is borrowed under the marginal lending facility. That's less than €150 thousand a month in savings - not even worth discussing. 3. Setting the deposit rate to zero (something the Fed had also considered) will have an impact on German and other stronger Eurozone institutions who have a great deal of excess liquidity. 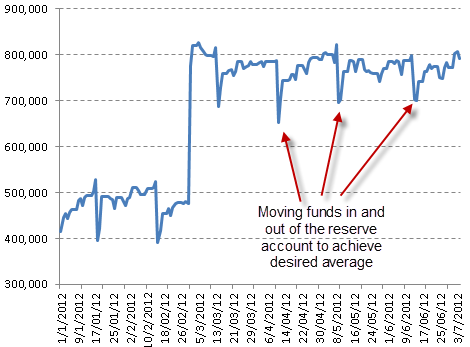 Thus far these banks have been moving funds between the reserve accounts and the deposit facility. That's because they need to maintain a minimum average balance in the reserve account (which pays zero interest on excess reserves). Once they achieve that average for the month (by holding an excess amount over a few days) they would move the funds back into the deposit facility which paid them 25bp. Now with the reserve account and the Deposit Facility both paying zero on excess reserves, they will simply leave the money in the reserve account. Other than this change, banks' behavior is not driven by what they receive on excess reserves and whether the reserves sit in the Deposit Facility or the reserve account. It is highly unlikely therefore that the difference between 25bp and zero on deposits at the ECB will somehow encourage these stronger banks to extend more credit. The markets were hoping for more action from the ECB on the heels of the recent summit. The hope was that if the politicians make a move in the "right direction", the ECB will reward them with more "non-standard monetary policy measures". But Draghi thought otherwise and of course the markets reacted accordingly. For further discussion on the ECB rate cut see this post by Kostas Kalevras.